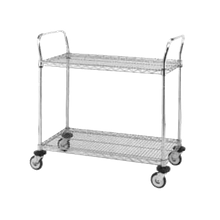 Eagle EU2-1836C Utility Cart, 2-tier, 36"W x 18"D x 37-3/4"H, open base, wire shelves with patented QuadTruss design, (2) handles, 500 lbs. 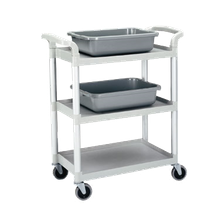 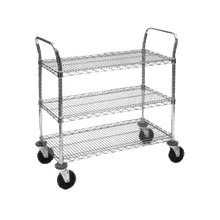 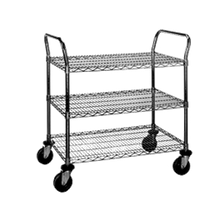 Eagle EU2-1824C Utility Cart, 2-tier, 24"W x 18"D x 37-3/4"H, open base, wire shelves with patented QuadTruss design, (2) handles, 500 lbs. 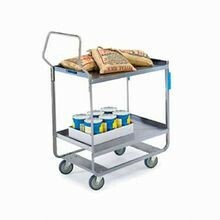 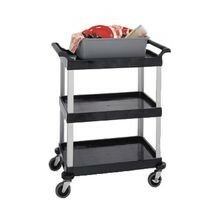 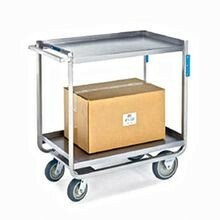 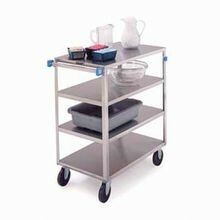 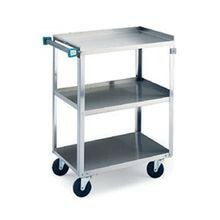 Eagle EU2-2436C Utility Cart, 2-tier, 36"W x 24"D x 37-3/4"H, open base, wire shelves with patented QuadTruss design, (2) handles, 500 lbs. 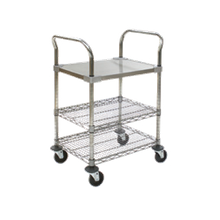 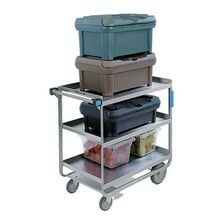 Eagle EU3-1836C Utility Cart, 3-tier, 36"W x 18"D x 37-3/4"H, open base, wire shelves with patented QuadTruss design, (2) handles, 500 lbs. 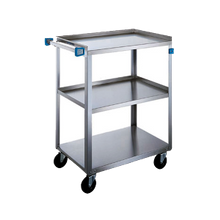 Lakeside 451 Open Tray Truck, (8) shelf, shelf size 21" x 35", (3) edges up, (1) down, 5-3/8" clearance, stainless steel with push handle, 500 lb. 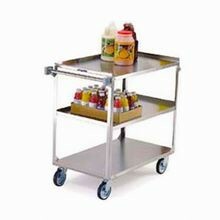 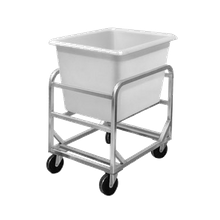 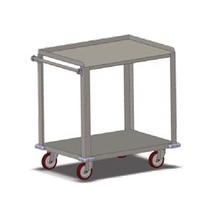 New Age 97126 Wet Produce Cart, mobile, 24-3/8" x 52", 700 lbs. 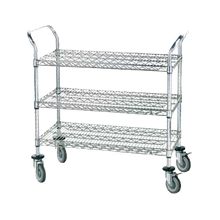 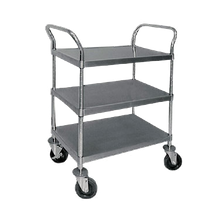 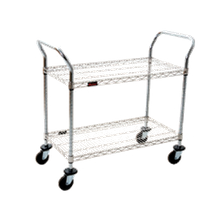 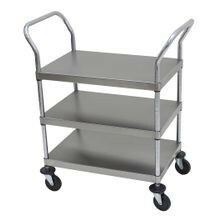 capacity, all welded aluminum construction, wrap around bumper on top shelf, (4) 5"
Lakeside 744 Utility Cart, open, (3) shelf, shelf size 33" x 21", U-shaped frame, all-welded stainless steel construction, 700 lb. 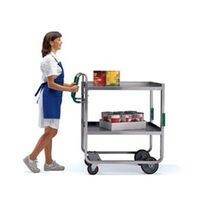 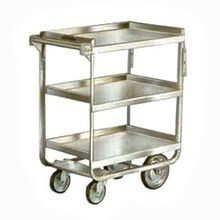 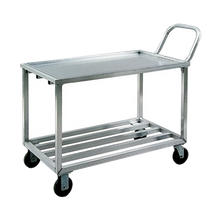 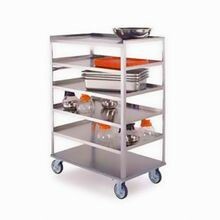 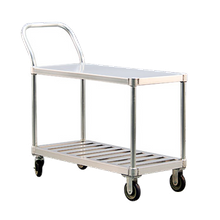 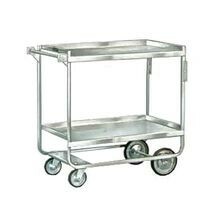 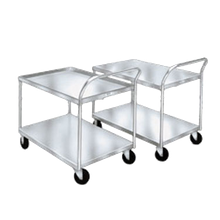 capacity, (2) 5"
From heavy duty stainless steel to plastic and aluminum, we’ve got the utility cart to maneuver and move your foodservice operations equipment with ease. 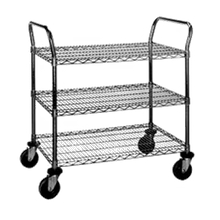 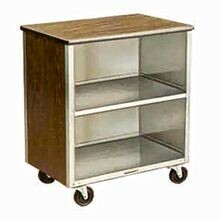 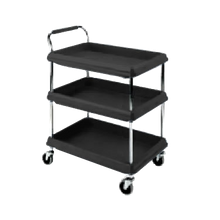 With various shelving types and configurations, utility carts are available in a large variety of weight capacities.